We get so worried about being pretty. Let’s be pretty kind, pretty funny, pretty smart and pretty strong. I have this quote hanging in my office as a daily reminder that there are far more important things to life than being pretty. Go out of your way to smile at someone, say thank you, and apologize when you need to. Make it your mission to be kind to everyone you meet. How do you do this? Think, speak and act with kindness. Learn from everyone to expand your understanding; everyone has a unique story. As soon as you recognize a need, volunteer to do something about it, don’t wait to be asked. Write a kind note, letter or email “just because”. Do a daily act of kindness without letting anyone know who did it. A good, hearty, belly laugh relieves physical tension and stress, leaving your muscles relaxed for up to 45 minutes after. Laughing decreases stress hormones and increases immune cells and infection-fighting antibodies. Laughter also triggers the release of endorphins, the body’s natural feel-good chemicals to help promote an overall sense of well-being and can even temporarily relieve pain. An elderly man is stopped by the police around 2 a.m. and is asked where he is going at this time of night. The officer then asks, "Really? Who is giving the lecture at this time of night?" Shut your mouth. Your mouth never taught you anything, so seek to sharpen your listening and observation skills. Pay attention to what people are saying. Listen to hear and understand, not to respond. In the olden days, research meant spending hours in the library. Now you can have an app on your phone with more historical data than the community library. My favorite way to brush up on history and other world matters is listening to podcasts. One of my favorite podcasts, TED TALKS by NPR, is an hour talk show that discusses Technology, Entertainment and Design. I typically listen to podcasts when I’m traveling back and forth for business on trips that are longer than 45 minutes. Let’s be physically, mentally and emotionally strong. 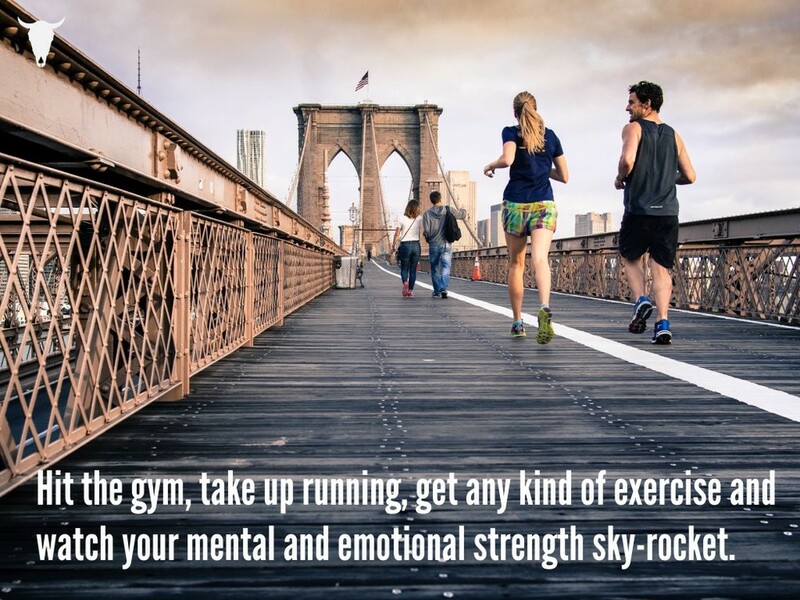 Physically Strong: Hit the gym, take up running, get any kind of exercise and watch how your mental and emotional strength sky-rocket. Mentally Strong: Stop taking things personally, holding onto the past, let go of illusions and stop trying to predict the future. Emotionally Strong: Identify specific areas that need work, acknowledge your strengths, consider your past experiences and track your thoughts on paper. Using a journal can help you to understand what may have caused you to feel emotionally weak and it is also a great way to relieve stress. Is there a quote that resonates with you? If so, what is it and how does it keep you going everyday?